‘CHESS – THE NEXT GENERATION‘ of players as well as long time players, will find themselves moving into the future with this traditional game. This exciting game relies on all the regular instructions for chess. However because of the dimensional factor, there is a need for additional instructions as to how the pieces move dimensionally. This set of instructions explains only the dimensional movement of the pieces. This also applies to and is explained here too, the new game “3D Chess960“. 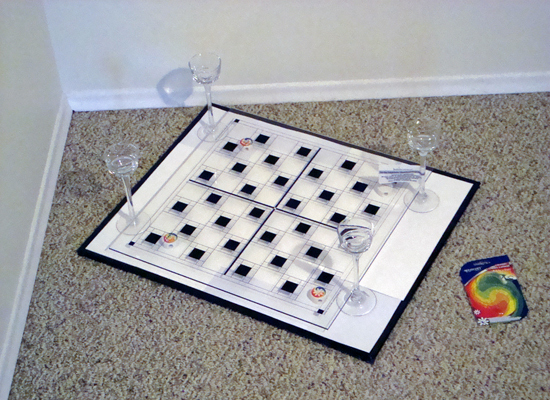 TWO PLAYERS: when the game is played with two players, there are two game boards of 15 x15 inches (38 x 38 cm) each, one on top of the other, and approximately 51/2 inches (14 -15 cm) apart. 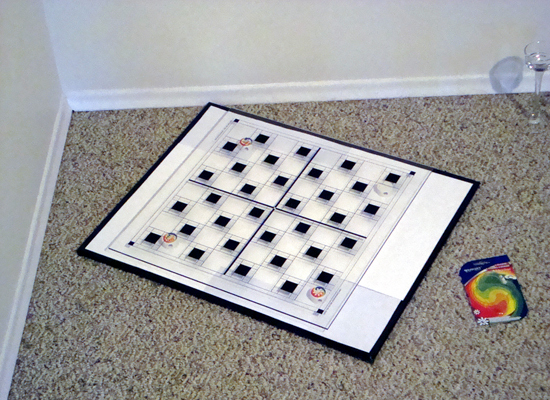 The top game board is labeled “A”, and the bottom board is “B”. The WHITE chess pieces are set up on level “A” or “B” (which ever he or she wants) in the traditional manner as in regular chess. 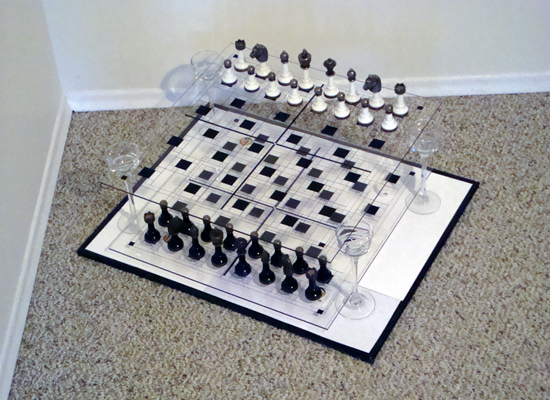 Then the BLACK pieces are set up in the traditional manner as in regular chess but on the other board level. Therefore if WHITE is on board level “B” then BLACK will be on level “A”. When you switch colours for the 2nd or more games, the person now playing WHITE has the choice of board levels. MOVEMENT: All movement of chess pieces on any one board level remains the same as in regular chess. The movement from one board level to another is as follows (see also diagrams on this website). (either diagonally or straight up and down), one level below or above the square on which it is currently sitting. ROOK Can move to or capture one square directly below or above the square on which it is sitting. the bishop to move on an ‘angle’, to/or capture a white or black square. KNIGHT Moves like an “L” dimensionally. Therefore, it moves one square down or up from the square on which it is sitting followed by movement two squares forward, (sideways or backwards). Pawns on their original squares on level “A” have the option of advancing one or two squares on level “B“. It thus mirrors a pawn’s opening move in regular chess. Can move to the squares directly below or above the square on which it is sitting. Down or up does NOTconstitute a backward movement. Upon reaching the opposite side of the board on any level, can be promoted to Queen, etc., and is distinguished as such for eg., by putting a red checker piece underneath it. occupies Ba6 -or- Ab5 x Bc5 & occupies Bc6). tries to pass on level “A” (Aa5), then (Bb5 x Aa5 & occupies Aa6 etc.). How long does it take to play a game of ‘Chess – The Next Generation’? 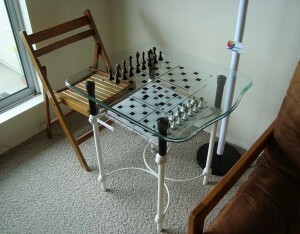 It takes the same amount of time as it would to play a regular game of chess on 1 flat board. In-fact, it takes about the same number of moves as well. 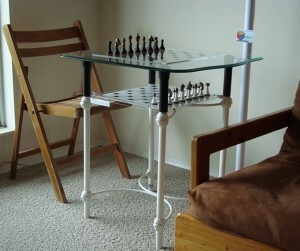 Here’s a 3D chess Table. So, Why play ‘3D Chess’ or 3D Games? Due to the dimensional factor of this game, the bishop is more powerful. more flexible, covers more area, and therefore worth six points. The rook is most effective for backing up and protecting (and on a level). 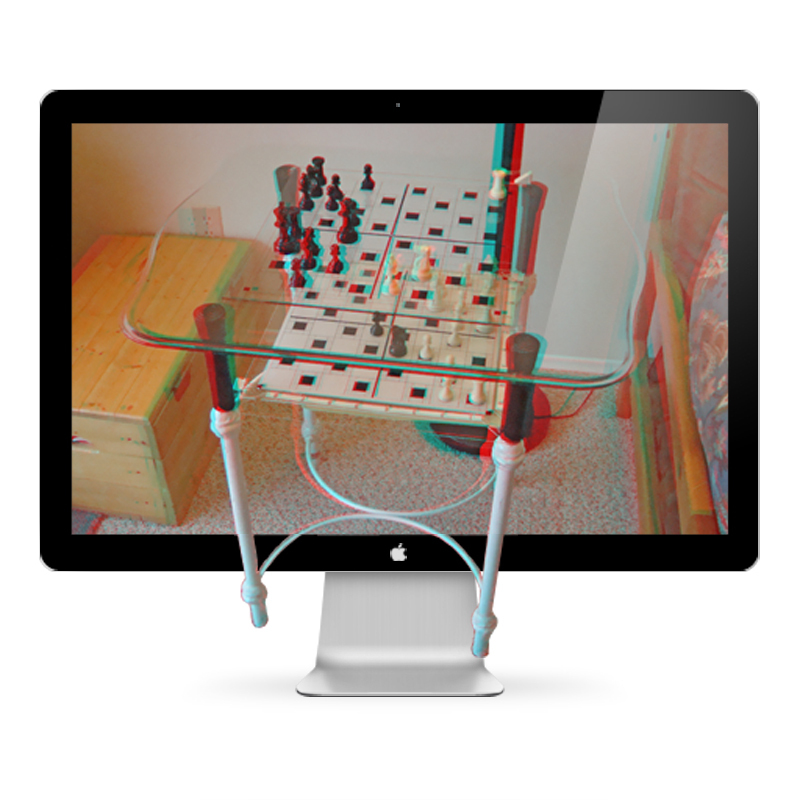 1st step to building your own 3D Chess Board Game. 2nd step: Slide the wine or Tealight holder base under the bottom board. 3rd step: Place a clear top board on the wine glasses so they line up with your bottom board. White gets to choose to be on the bottom or top board. Black is on the other board level. There! You are now ready to start playing a game. There is a faster way to set a 3D Chess game on the other page. Just scroll down to near the bottom. Find a piece of clear glass or clear plastic that is the same size or larger than your regular chess board. 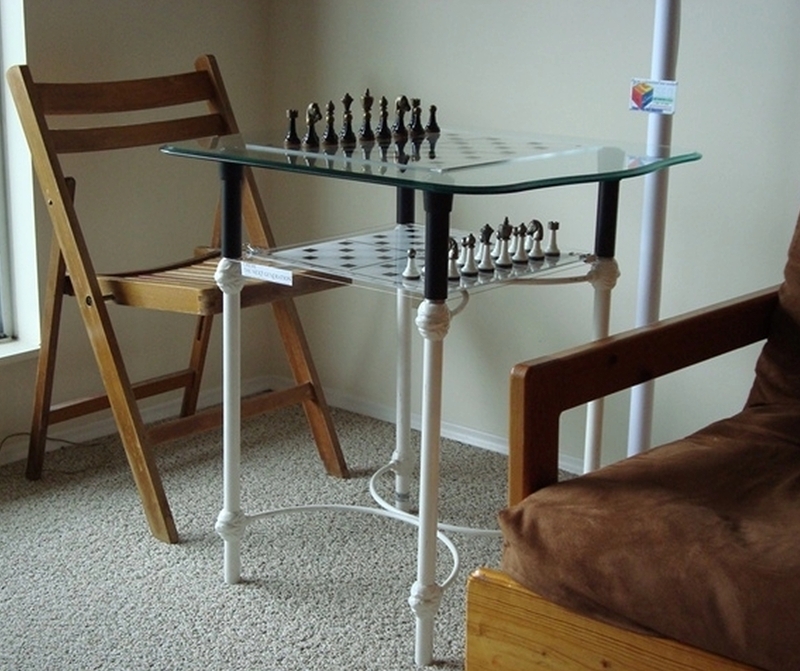 Place or lay the glass on top of your regular chess board. Now use a marker to trace out where the squares are -or- Use Masking Tape and cut squares from the tape to match the Black squares of your regular chess board. 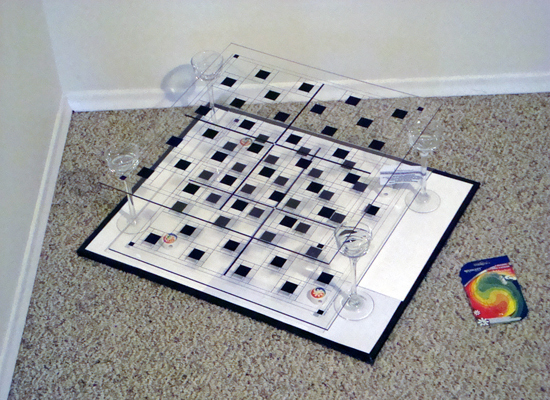 Of course you could just get a 2nd chess board and use wine glasses to support it, then you would have your 3D chess game ready in 3 minutes or less! Put all the above together and Watch a game from start to Checkmate in 14 moves. Now for a 3D view of the game. You’ll need those ‘3D red/cyan glasses‘. When playing regular chess (or 2D flat 1 board chess), you only have a certain amount of good opening moves to make. Some moves are bad moves or losing moves. However you must move the pawns to get things in motion (except the knights). Therefore, you are limited to what you can play as a good bunch (1st five moves) of opening moves! However, when playing 3D Chess (or “Chess – The Next Generation”), you have 16 possible opening moves! There is also an incredible number of opening combinations (1st five moves) that would never have existed in regular 2D chess. Plus it’s more exciting from the very 1st move. Your opponent will not know what you are trying to do. Remember, it takes the same number of moves and time to play as in regular 2D chess, just more exciting.